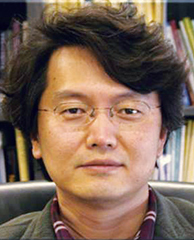 “Structural Biology” and “Synthetic Biology”. 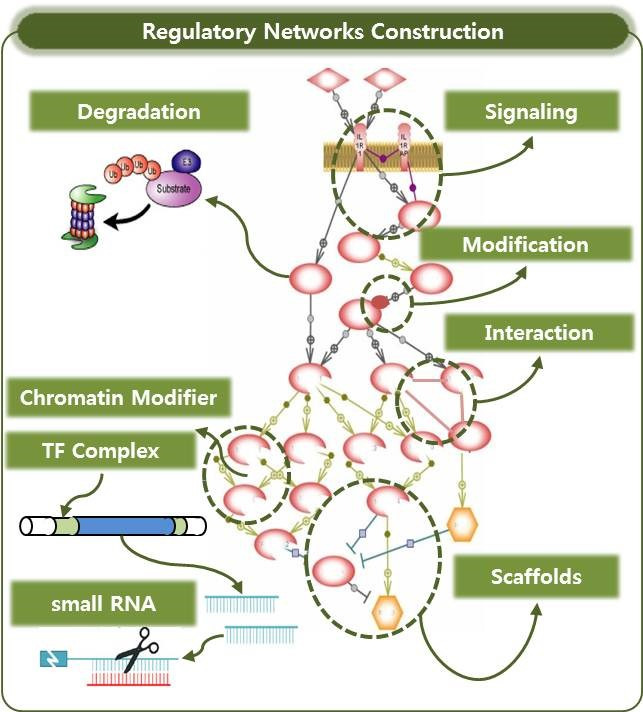 We construct system-wide cellular regulatory network models composed of the regulation of gene expression, modification, degradation, and inter action in different cellular conditions. In our study, the concerted genetic or epigenetic regulation mechanisms in gene expression including the function of chromatin modifiers, transcription factors and small RNAs are integrated with the protein level regulation such as protein modification, interaction, localization and degradation. We infer the regulatory relations among the genes with their relational patterns in sequence, expression, interaction, and biological function from the scattered data in literature and biological databases. 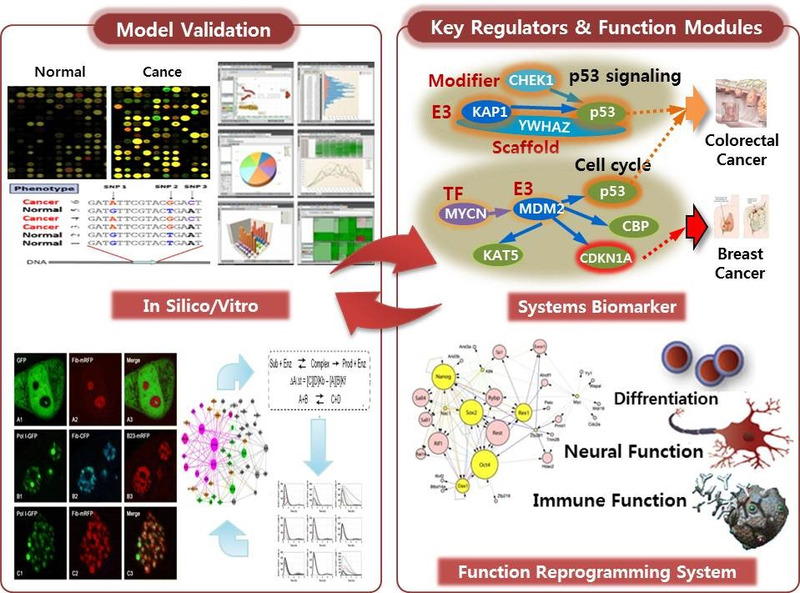 Using the integrative logical inference or computational simulation, we predict the possible regulatory models and important system markers (or regulators) including receptors, channels, scaffolding proteins, transcription factors, E3 ligases and other modifiers. We test the suggested regulatory models by using molecular and cellular function assays. The relations of genes in the model can be reconstruct in a systemic way with the data of condition specific Omics experiments. In conjunction with individual or systemic cellular function assay, the roles of key regulators, their relations and their possible drugs in a system can be verified. 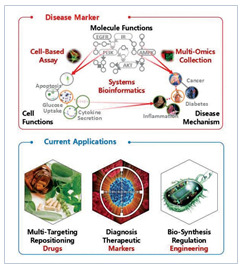 Through this validation process, we pursue to discover the key regulators and their specific relations controlling cellular functions involved in diseases, which can be suggested as system biomarkers or engineering targets. One of our research target is to develop an efficient systemic cell based assay in this process. Top-notch micro and nanotechnology will be integrated with molecular and cellular Omics technology. Our first engineering target is changing molecular interaction of key proteins regulating cellular functions. We also try to engineer the bio-synthesis process in cell to generate diverse types of biomolecules efficiently. 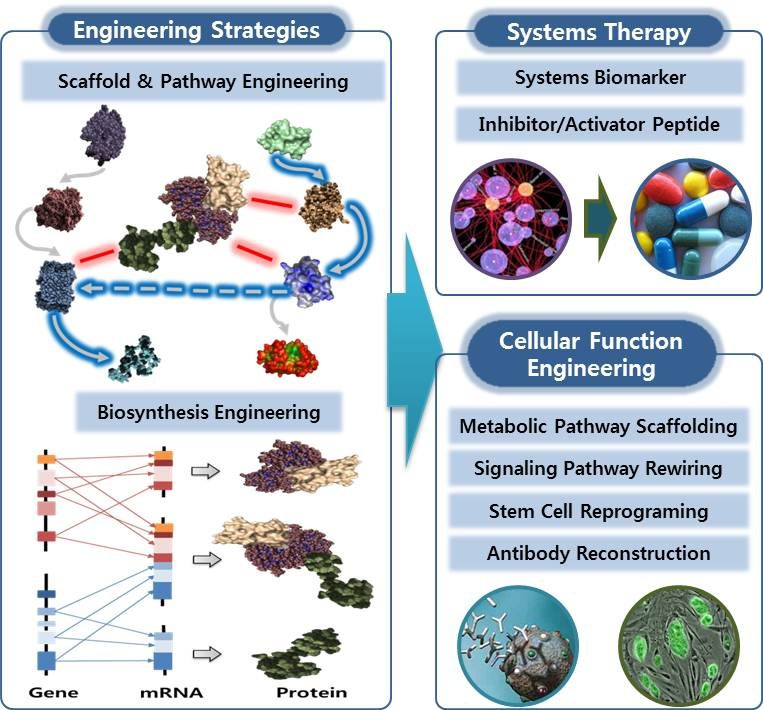 Our integrative approach will support to develop an efficient engineering method that overcome many huddles that current synthetic biology faces in practical implementation. Especially, we are interested in using or making multi- functional and multi-targeting molecules. Those engineered biomolecules can be used in detecting or manipulating the cellular functions including cellular pathways or regulating circuitry with high fidelity and flexibility.